Let someone know they a Reflector of His glory! As the artist, I send this card often to thank someone who has been kind, and for birthdays, anniversaries, encouragement and all occasions (and for no occasion)! 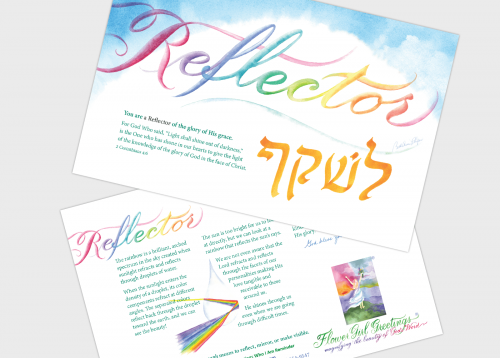 This high-quality art card is blank inside and includes a grace-filled devotional on the back. This card measures 5½ by 8½ inches, includes an envelope, and can be sent with one regular stamp. Six of the 12 prints from the Who I Am Journal Collection have been modified for this Collection to become greeting cards that focus on the recipient and are not associated with months of the year. As the artist, I send these cards often for birthdays, anniversaries, encouragement and all occasions! They are blank inside and include grace-filled devotionals on the back. Let someone know they are Beloved, Blessed, Beautiful to God, Hidden in His love, a Reflector of His grace, or Redeemed.